This web site contains a private collection of data for our family and is intended to enable them some understanding of ancestors' actions. This is a limited history of one extended-family. This is not a Mackenzie clan history, that is a more complex and comprehensive story. My father's family descends from Cosimo di Gherardini the Great, Duke of Florence (c975-1031), through his grandson Sir Other FitzOthoere, Baron of Windsor. My key source is Sir E Mackenzie Mackenzie, who examined Fitzgerald family records and reported the implications to the Mackenzie pedigree. We share that descent with many other families, notably the FitzGeralds, de Windsors, Others, and the Bendings. My mother's notable ancestor is Sir William Johnson and his pedigree includes the O'Neill kings of Ulster in Ireland. Each of the following historical snapshots may be interesting as a separate subject, but they are intended to add context to the whole of a family story. I have made only modest attempts to correlate the data and each of the following topics should be considered as standing alone. The primary contents relate to genealogy and reveals a series of lineages, pedigrees and writings, which help to clarify our family past. The claim by Kenneth McKenzie (1837-1903) and his family that following the death of his father and two uncles, he was the entitled baronet of Coul. The possibly fictional Uther Pendragon (c400) and his relationship to the Roman emperor Constantine (272-337). The existence of the Saxon god Woden (c280-c335) and his possible human origins as an historical Saxon king. The detailed individual records are the subject of my primary database. Because Europeans traditionally followed the male line our Mackenzie pedigree might truncate at Cosimo (also spelt Cosmos and Cosimus). However, modern research tends to discount tradition and primogeniture and follows bloodlines wherever the genes, or marriages, lead. Recalling that only 20 generations give more than one million people (without siblings), this database includes over 80 generations. That means there are a lot more names waiting to be incorporated. Unfortunately family names get lost and details become vague (what exact year was Christ really born? ), people don't track many shepherds and we are left with historical figures. I have therefore included a number of the European nobility. They are certainly not all direct relatives, but most are at least cousins, or are related by marriage. There is, of course, a considerable body of additional information, both historical and genealogical, which I chose not to include. I have been motivated to keep the discussion related to this family, however distantly, and have not gone into great detail with weapons or similar subjects. Those latter details are readily available elsewhere. To help my own family follow Western historical developments, highlighted by people included in our database, I created a few explanations of historical events relevant to our family. My selection of topics was based on supporting an understanding of where we came from and why family members might have acted as they did; perhaps some nuance might further clarify historical motives. I have included Celtic, Roman, British, English, Scottish, and other historical stories about the Mackenzies, their forbears, and relatives to augment our family story. I hope these data will be helpful to the reader who wishes a little more. I have shown a series of lineages, pedigrees and writings, which may help clarify our family past. I have also included: European monarchs, North American forts (built by Europeans), specific North American battles and their participants, and lists of European commanders. Like ancient European churches, their well known histories illuminate their eras and therefore our family backgrounds. Some information, like the ‘European Balance Of Power’, and slavery are provided to clarify concepts, which I have included in the main discussions. I have noted those wider family members serving with Wellington at Waterloo, not because they were related but to illustrate how those families had integrated into the British Establishment. These historical snapshots are intended to add context to the whole of a family story. Soldiers they may kiss my arse. 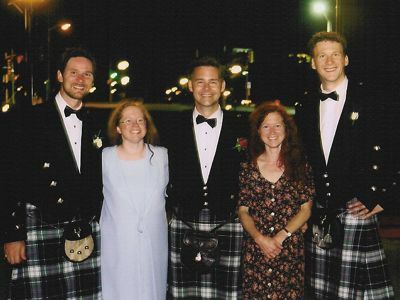 Our Mackenzie family has many origins, the Mackenzies being only one, and certainly not the eldest identified here. (Modern men did not invent interest in family history and there are a well-known pedigree-trails that links us back to the pharonic Egyptians and their neighbours.) This data does not specifically address the formal Mackenzie Clan history, although most historical Mackenzies are included. Traditionally the Mackenzies begin with the FitzGeralds in early Norman Ireland. In fact, we have traced the FitzGerald ancestors back through Wales, England and Italy. Each new bride brought her own family history and extended our family origins. I have tried to trace them all and readers will see that many leads just stop where further data must surely be available. Sir William Johnson's granddaughter, Mary, married Colin MacIver (who changed his surname to Campbell). Colin is better known as Colin Campbell, Field Marshall Lord Clyde. It was this Colin Campbell who formed the 'Thin Red Line' at Balaclava and who 'Relieved' the 1858 Siege at Lucknow. Twenty family generations generate one million grandparents (never mind siblings). This genealogical database documents 150 generations, and before electricity LARGE families were clearly more the rule. This number of families means that there are billions more names waiting to be found just to complete this family database. Unfortunately names get lost and details become vague. (When was Jesus Christ really born? Who were the shepherds who witnessed his birth?) History doesn't record most shepherd's details and we are often left with just historical figures. I have recorded a wide number of historical personalities, who are at best only distantly related by marriage, to help define the times of our family members. Approximately 25% of the names are direct (grand-parental) family members. Our ancestors earned royal trust and married into royal families. Our descent equally follows both the male and female lines and my mother's family pedigree is quite interesting and has been included. It was for this reason that the term 'tree' was coined, since the line of descent would branch out from the 'main trunk'. I have therefore included cousins by marriage in the main database starting with my own. European marriages seemed to remain within a social class for political reasons and thus extend around Europe. To provide an historical context, I have incorporated a few notes for some historical figures. I have also included historical backgrounds to help recall possible motives for personal actions. "What task could be more agreeable than to tell of the benefits conferred on us by our ancestors, so that you may get to know the achievements of those from whom you have received both the basis of your beliefs, and the inspiration to conduct your life properly?" I am grateful to the following for the use of their indicated material, or assistance. The nature of genealogy requires prior work upon which to build, and especially the key input of historical family genealogies. Being a history, use has been made of historical research by others. The many individuals who have generously shared their family pedigrees via the Internet. Sir E Mackenzie Mackenzie for his research and documentation of The Genealogy of the Stem of the Family of Mackenzie, Marquesses and Earls of Seaforth. Burke's Peerage and Baronage for the use of Mackenzie genealogical data, especially their Mackenzie of Coul descent. The Canadian government for the use of the Canadian, British and Scottish Royal arms. The Chancellery of Canadian Orders and Decoration and Government House for the background information on Canadian Honours and Governors General. The Public Archives of Canada for the use of copies of their indicated Colonial painting collection. The Coul House Hotel for permission to use photographs of the paintings of Queen Victoria at Coul House and Sir Robert Mackenzie. Brian Thompsett at the Department of Computer Science at the University of Hull, in England, for his Royal Genealogy Database at http://www.dcs.hull.ac.uk/public/genealogy/royal. My extended family input of genealogical data, anecdotes the use of various photographs and proofing corrections. Most especially I am grateful to my aunt Birch Hotz, and my cousins Janet Harding and Patricia Patterson for their identification of family names..
My cousin Lee Hotz for his research and his article "THE HUMAN FACE OF WAR", which pointed the way to resolve a family mystery. My sons Ian, Colin, and Jamie for their help in making this web site data accessible. George Betts for his advice concerning Upper Canadian history, sharing of Boulton genealogical data, and a copy of General Dearborn's 1813 Prisoner List. Many United Nations and NATO international staff members who provided corrections, national insights, explanations, and information. 1 This is discussed by J Horace Round in his article in "The Origin of the Fitzgeralds", in The Ancestor, vol. 1, pp. 121-122. 2 Sir E Mackenzie Mackenzie, The Genealogy of the Stem of the Family of Mackenzie, p.8; he made a considerable research of primary sources, which included original Fitzgerald records.